Books happen. Today’s score: Rafael Sabatini, an obscure Streatfeild, and Q.
I must share my little gloat. Lovely book-luck day today! I was in town fulfilling some rather ho-hum errands, namely picking up plumbing supplies and visiting the dentist, and, with a half hour to kill, I wandered into a little antique store just down from the building supply store. As is my usual habit, I automatically perused the “antique” books used for set dressing in such emporiums, and bingo! -an unexpected bookish jackpot. Two Rafael Sabatini novels, The Lion’s Skin (1911) and Bardelys the Magnificent (1906). One of Noel Streatfeild’s “adult” novels, Grass in Piccadilly (1947). And – so unexpected and so very perfectly timed, because I’ve just finished reading Helene Hanff’s memoir Q’s Legacy – a handsome 1921 copy of On the Art of Writing, by Sir Arthur Quiller-Couch. And a fantastic little book from Herbert Jenkins Ltd, published in 1952, The Crossword Companion, by “M.R.W.” This being a book of word lists useful to the crossword aficionado – what a helpful concept. Love it already. I’ve dipped into the Streatfeild, though I must stiffen my resolve and set it aside in order to finish my current book, Edna Ferber’s okayish-so-far-though-not-stunningly-wonderful Showboat. Mulling over the possibility of undertaking another Century of Books project – the Sabatini oldies in particular would be perfect candidates for some of those elusive early years. I’ll keep you posted on that, and I’ll report back on the Piccadilly thing as soon as I finish it. Two chapters in, and the tone is very slightly sordid and more than a little cynical – if you’ve read The Whicharts, you’ll be familiar with the style. That’s it for now – over and out. The Fire and the Wood. A Love Story. by R.C. Hutchinson ~ 1940. This edition: The Literary Guild of America, 1940. Hardcover. 440 pages. I have just stumbled upon a now-obscure, once-bestselling British novelist. Why have I not heard of Ray Coryton Hutchinson before? Seventeen books published between 1930 and 1975. The third, 1933’s The Unforgotten Prisoner, sold over 150,000 copies in its first month. A Child Possessed, 1964, won the W.H. Smith Literary Award, and is the inspiration behind a 2012, 2-act orchestral opera composed by Robert Paterson. The last, 1975’s posthumously published Rising, made it to the Booker Prize shortlist. 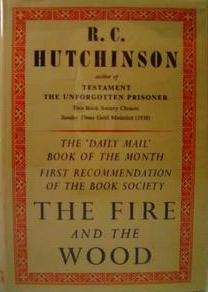 The Fire and the Wood, apparently regarded as merely one of Hutchinson’s “average” efforts, is a downright excellent piece of authorial work, being utterly relevent to its period, chock-full of easily absorbed “message”, and, best of all, compulsively readable. I couldn’t put the thing down. The writing flows, the whole transcends its parts. Brilliant work. You will remember that I told you Josef’s story one evening, the summer before last, in the Half Moon at Clare. You thought then that it was worth putting on paper, and I still think it was. But the time, between now and then, has not been a good one for the job: the means by which we know what is happening round the world have become so efficient that it’s increasingly hard to concentrate, for several hours a day, on the fortunes of one or two people. The excuse, of course, is not valid: no excuse is valid. The masters of the trade have done it as well, and sometimes better, when the hubbub was loudest. But I myself find difficulty, with these cold winds blowing incessantly against the mind, in raising it to that temperature which seems to me necessary for work which has the smallest pretension to seriousness; and I fancy that some others among the feebler-hearted brethren may be in the same case. I mention the handicap as an apology for dedicating such a book as this to you, an amateur suckled by Turgenev and weaned on Henry James. Will you take the gesture as one of gratitude for many kindnesses, and for twenty years of friendship? What follows this elaborately modest introduction is a dense but never staid novel, approaching farce in its humorous opening scenes, darkening by imperceptible degrees into a nightmare scenario, a Kafkaesque dream sequence, appalling reality and delirious fever-dreams ever more entwined. In the mid-1930s, young Doctor Josef Zeppichmann, newly qualified, joins the staff of a prestigious hospital in a large German city. Coming with glowing references which are at odds with his awkward manner, lumpy countenance, and country-lad ways, Zeppichmann proves to be an exceedingly competent doctor, though his bedside manner is brusque to the extreme, and his concentration on the ailments of his patients with the casual exclusion of all unimportant details such as name (or even gender) soundly shocks the nurses. For Josef Zeppichmann is at heart a medical researcher, a bacteriologist concentrating on an audaciously risky cure for tuberculosis. Pursuing a pet theory during the latter years of his medical internship, he has progressed to the point of wishing to experiment on human patients – his guinea pig and rat trials have been remarkably successful – in most cases – but Josef runs up against a brick wall in the strict Moltke hierarchy; he is not even permitted to examine the patients in the TB ward, and is restricted to junior doctor duties in the general wards. But Josef is made of stern, single-minded stuff. He bullies his way into the best room in his new boarding house, and sets up his own private laboratory. And what’s this? Close at hand, the kitchenmaid Minna is showing unmistakable signs of an advanced lung complaint. When she collapses one day while working, Josef is quick to grasp the heaven-sent opportunity of a human guinea pig. He takes advantage of the boarding house owners’ strict economy to offer treatment free of charge in return for exclusive access to the girl, and the real experiment is on. Meanwhile, on the post-Weimar Republic mean streets outside the hospital, civil unrest is brewing between various political factions. The roving bands of young thugs running under the banner of the National Socialist German Workers Party are becoming more and more efficient in striking out at anyone they suspect of being in less than perfect sympathy with the cause of Germany’s new Chancellor, a certain Adolf Hitler. Josef inadvertently runs afoul of a group of these young “Nazis”, and repercussions are swift to follow. For Josef Zeppichmann is a Jew. As Minna moans in fevered agony, emaciated body struggling to cope with Josef’s escalating injections, a series of increasingly somber blows fall upon our protagonist, culminating in his dismissal from his hospital post and his arrest and subsequent detainment in a political prisoner internment camp. Luckily for Minna, Joesf has had time to give her the last vaccination in his series, and it has apparently proven successful. She and Josef have also formed a strong attachment, with the doctor-patient bond turning at the eleventh hour from pure need of each other in an elemental sense – Josef needing a subject for his research, Minna needing a cure – to unanticipated love, just in time for Minna to see Josef dragged away in handcuffs, leaving behind his precious medical notes in her care. The suspense continues to build, escalating to a daring rescue-escape of the damaged lovers via canal boat to Holland, and thence to England. But their troubles are far from over, for Josef has in turn contracted TB in the prison camp, and Minna herself is still weak from her long ailment. R.C. Hutchinson had an agenda, which was to bring the horrific pre-war social conditions in Germany to his reading public’s attention. Fascinating to read what is basically a propaganda novel, published in 1940 before the worst of the Nazi Party’s subsequent excesses became common knowledge. It’s a clever piece of work, brilliant even, and as I mentioned earlier, a page-turner from start to finish. So, R.C. Hutchinson. Ever heard of him before? I hadn’t. And I should have, I think. He’s unaccountably fallen by the literary wayside, though Bloomsbury has recently released a number of his novels in e-book format, and his long list of out-of-print bestsellers are easy enough to find in numerous editions through online booksellers. R.C. 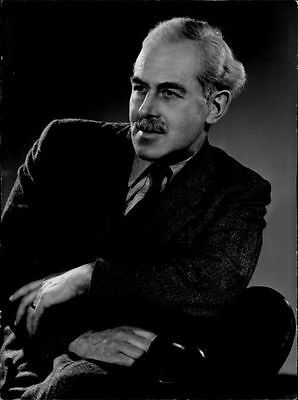 (Ray Coryton) Hutchinson, 1907-1975, in an undated publicity photo. 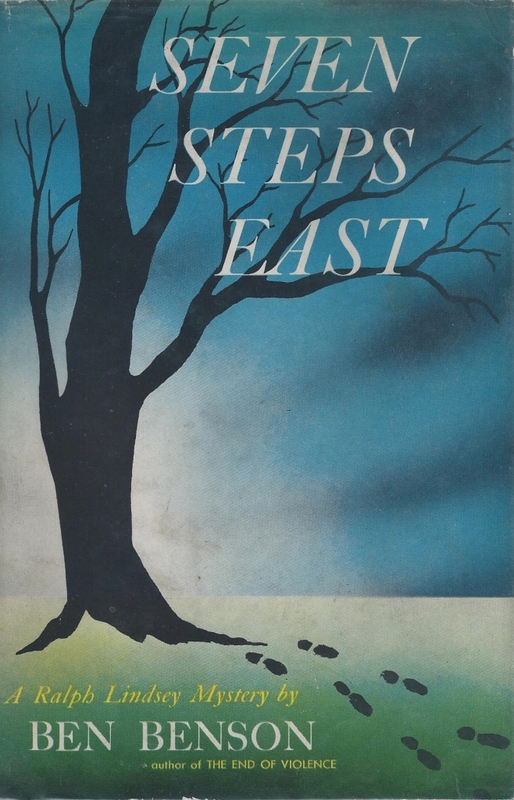 Seven Steps East by Ben Benson ~ 1959. This edition: M.S. Mill Co., 1959. Hardcover. 189 pages. Summertime, and the reading is easy. This reasonably diverting police procedural is my first encounter with this writer, and I’d cheerfully pick up another if it showed up in front of me. It worked well for kick-back time yesterday. Enough puzzle element and moral dilemma discussion going on to keep it from being too black and white, and characters with enough personality to keep them straight in one’s head for the time needed to polish off this slender and more than slightly unlikely mystery. Seven Steps East is the last title by Ben Benson, who started writing as therapy after spending three years in hospital due to war injuries sustained during his 1943-45 U.S. Army stint of active combat. 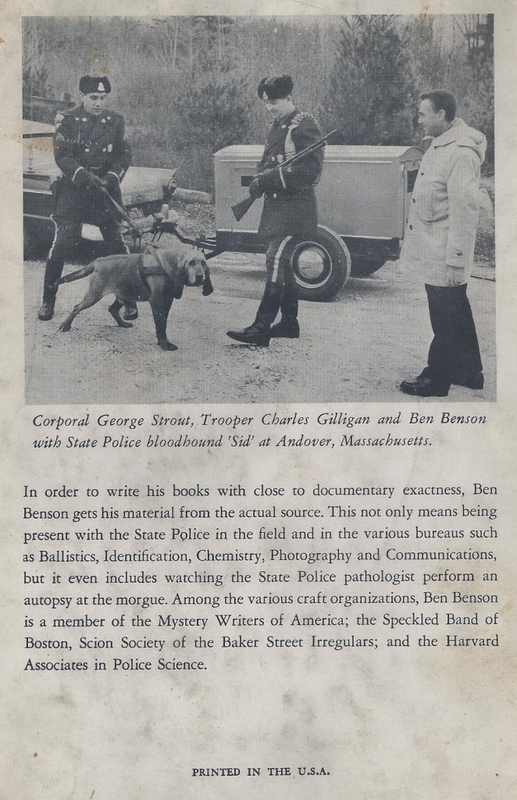 He wrote something like 17 mystery novels between 1951 and his death at the too-young age of forty-four in 1959, sharing the key investigative roles between two fictional members of the Massachusetts State Police: Trooper Ralph Lindsey and Detective Inspector Wade Paris. In brief, our main character Ralph Lindsey is given leave to investigate the disappearance of one of his star students, Kirk Chanslor – coincidentally a childhood acquaintance now engaged to be married to Lindsey’s ex-girlfriend – when the young man fails to return from a weekend’s leave from the State Police Training Academy where Lindsey is a part-time instructor. An anonymous phone call leads Lindsey to Kirk Chanslor’s body, hidden beneath a pile of leaves in the forest, and the hunt is on for the killer. Benson quickly takes us through the steps of a murder investigation, giving a willing nod to each member of the homicide team. Surprisingly for the genre, Ralph Linsey apparently gets along just fine with everyone in his department; there are no internal feuds or personality conflicts; everyone cooperates wonderfully, united in their goal to nail the bad people of their precinct. No question as to which side the cops are on – they hang out with the angels from start to finish. Chasing down leads among hotel waitresses and bellboys, the investigation has Lindsey making himself unpopular with a powerful ex-gangster-turned-hotelier. Illegal gambling and a highly successful con-artist – someone who can change their eye colour at will, according to the one clue Kirk Chanslor has left behind – hold the key to the solution. I guessed the gambling con early on, but the actual killer was a bit tougher to pin down, though when the big reveal came I wasn’t at all surprised. All in all, a workmanlike piece of writing, with moments of flair and the promise of an interesting development for Trooper Lindsey’s future. A shame this turned out to be Ben Benson’s last book. *The lowish rating reflects that while the book is readable enough, it is nowhere close to the top of the high standard set by the best in the mystery-thriller genre of its era. Raymond Chandler, Josephine Tey, Margery Allingham, Rex Stout, among so many others.